It is a fundamental feature of the quid pro quo of the patent system that details of patents and applications are made publicly available. With the (usual) exception of the US, where applicants not filing elsewhere have the option of delaying publication until grant, in almost all other cases globally applications details are published at around 18 months after the initial priority date. Obviously all of this patent data is very useful. It provides a large part of the "prior art base" used to assess the novelty and inventiveness of subsequent patent applications. It is a source of technical information in relation to the activities of individual inventors and corporations. It can be mined to provide competitive intelligence regarding the commercial activities of companies in particular industries, or even to identify market opportunities in technologies that are not being fully exploited. And, of course, it can be searched to identify potential infringement risks or to establish freedom-to-operate. On the other hand, we have recently witnessed a notable rise in patent-related spam and scams, some of which is based upon the ease of availability of patent information through free online databases provided by national patent offices, the World Intellectual Property Office (WIPO), and privately operated services such as Google Patents. We discuss below two common examples, and one other recent experience. As far as we are aware, the "unauthorised register" scam started with trade marks, but in recent years has become increasingly prevalent in relation to patents, and particularly International Patent Applications filed under the Patent Cooperation Treaty. The scam works as follows. The scammer monitors relevant public databases, such as the PatentScope service on the WIPO website, for newly-published applications. They mine this data for applicant details, and then send an official-looking letter directly to the applicant (bypassing any agent) offering to include the application on a register, upon payment of a fee, typically on the order of 1,500 US dollars or Euros. The letter commonly looks like an invoice, although somewhere in the "fine print" it will expressly state that it is a "solicitation", and no payment is required. Nonetheless, these scams have been operating for so long now, we can only assume that they more than cover the relatively low cost of operating the "business". The fact that many of the letters provide corporate addresses in "trustworthy" jurisdictions, such as the US, western Europe or Australia, adds to their apparent legitimacy. However, it is our belief that most, if not all, are using "virtual office" services to create an apparent presence in other countries. WIPO maintains a list of example unauthorised register scam letters on its website. Many of these bear logos that look remarkably similar to the old WIPO insignia. It is no doubt only a matter of time before they adapt to the new logo. A number of the associated websites (at which registered users can, allegedly, access the scam databases) look and fee remarkably similar, right down to common grammatical and spelling errors! See, for example, websites of the "International Bureau for Intellectual Property", the "World Bureau for Intellectual Property", and the "International Organization for Patent & Trademark Service Corp." Either these organisations are ripping each other off as much as they are unwitting applicants, or they are all fronts for the same business. None of these registers has any official status, and none confers any additional rights or benefits upon the applicant. Please dispose of you unauthorised register scam letters thoughtfully. Patentology supports recycling. The WIPO database is also increasingly being used by patent attorneys and agents to identify international applications that are nearing the 30-month deadline for filing of national patent applications. They can use the applicant or agent details to send out unsolicited letters offering their services for the filing and prosecution of a national phase application in their country. We are currently seeing this most commonly from South East Asian countries, including Indonesia, Malaysia and Vietnam. It is likely that where such messages are sent via email to Australian recipients, they would breach the Spam Act 2003. Many other countries have similar legislation. However, as a practical matter the enforcement of such laws against relatively low-volume foreign senders is not generally feasible or worthwhile. In common with some other messages that are technically "spam", foreign agent spam is not necessarily entirely without value. For intellectual property firms that receive such communications in their capacity as agents for various patent applicants, they provide a channel for the identification of prospective new service providers in other countries. However, we imagine that most firms would prefer to receive one direct contact, rather than an avalanche of form letters associated with every international application ever filed through the firm! When sent directly to an applicant, foreign agent spam may be confusing and potentially disadvantageous. A naive applicant may form a false impression that they are under some obligation to take steps in a particular country. Additionally, as in any field of human endeavour, the quality and experience of practitioners can vary significantly. Agents that are resorting to unsolicited mailings are not necessarily the cream of the crop. Patent attorneys and agents typically have existing relationships with associates in other countries. While applicants can generally rely upon their local representatives to use good judgement in selecting foreign agents, we would encourage them to raise any specific concerns or requirements. Foreign agent spam should be treated with caution. We were recently contacted by a client requiring advice in relation to a letter they had received demanding the payment of royalties to avoid "infringement" of a published US patent application. The letter was sent by the applicant himself. It was fairly clear that he had no relevant legal training, however the client did not know to determine whether they should be taking the letter seriously or not. the client was not operating in the US in any event. We were able to assess this case in just a few minutes, and provide some feedback at no cost to the client. However, in a less clear-cut case the client may have had to incur significant expense, possibly including obtaining formal infringement advice from a qualified US patent attorney. There is a wide spectrum of users of the patent system. Most would agree that companies that are using their patented inventions in the marketplace are legitimate users of the system. Views vary on "non-practising entities" (NPEs), which range from Universities and research organisations, to patent holding, acquisition and enforcement companies. Our own view is that most of these are legitimate, although some regularly attract the pejorative label "patent troll". Then there are those who intentionally abuse the system, engaging in inequitable conduct and fraudulent activity. Most countries have laws prohibiting inequitable or fraudulent use of patents, however the cost of enforcement of such laws will often exceed the nuisance value of the fraudsters. Finally, there are the poor, deluded (yet sincere) fools and cranks who genuinely believe that they deserve to be rewarded for their "inventions" and, in extreme cases, consider anyone who stands in their way to be a participant in The Great Conspiracy. We think that our client's correspondent in this case falls into this category. We believe that there is little that can be done about this third group, because in many cases the only way to distinguish between a legitimate NPE threat, a scam and a crank is to obtain appropriate professional advice. 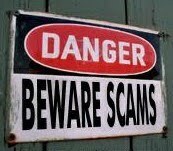 Our hope is that the fraudsters and cranks remain a small element in the system.